DJI's Matrice 100 combines the ease of use of a ready-to-fly quadcopter with the flexibility of a build-it-yourself model. 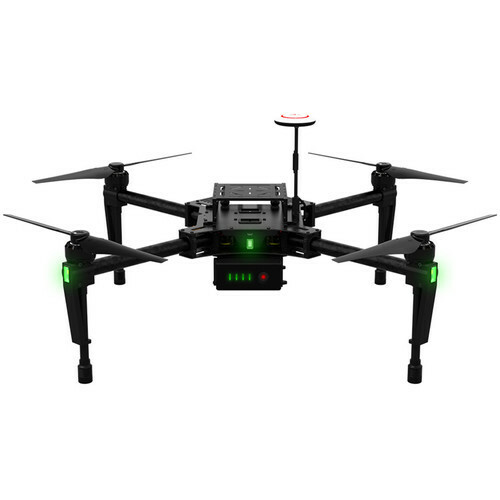 Sporting an "X"-configuration design, the Matrice 100 acts as a platform for various DJI and third-party cameras that can suit any professional or industrial purpose. 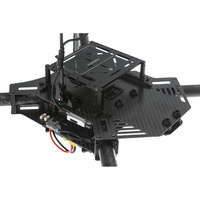 Stackable modular bays simplify adding components such as flight control extensions or a second battery, while the prop arms can be set a slight angle to increase torque. DJI SDK enables developers to create totally custom software, ideal when using the platform for highly specialized applications. 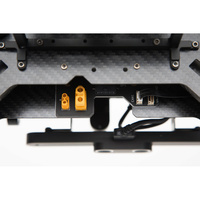 Additional expansion bays allow you to add components to the flight control system, customize the payload, and fly with any devices of your choosing. Put cameras, sensors, computing boards, communication tools, and more into the sky, and gather data while completing complex jobs from a birds-eye view. Two Expansion bays are included and additional bays are available separately. 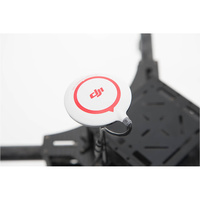 Connect and fly with a range of DJI or third party devices, and transmit data to the ground in real time. 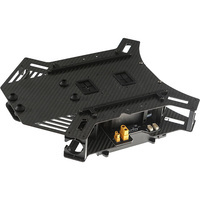 The Matrice 100 has dual parallel CAN-bus ports for connecting DJI devices including the Guidance sensor system and dual parallel UART ports for connecting third party components. An additional battery compartment means it is possible to achieve up to 40 minutes flying time when two TB48D batteries are used (one TB47B included; additional batteries available separately). Note: Flight times vary based on payload, flight conditions, and other factors. Sliding the battery and other compartments allow you to put components where it's most convenient while keeping the aircraft balanced. 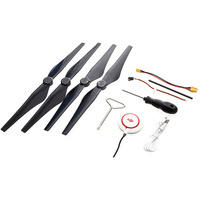 The prop arms can be tilted 3-degrees for increased yaw torque and greater response. To reduce vibrations and increase stiffness, key components of the Matrice 100 are constructed from carbon fibre. Each of the arms contains a soft vibration absorbing material designed to eliminate feedback from the motors, keeping critical components stable while enabling precise navigation. Landing pads installed at the base of each arm help protect the Matrice 100 when landing. These pads reduce impact, protecting your system and reducing the chance of your platform unintentionally lifting off of the ground. They can be removed for replacement or upgrades. Take control of your platform with the customizable, long-range remote controller included with the Matrice 100. 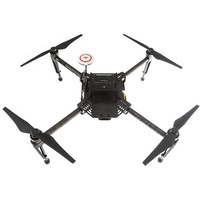 Featuring an operating distance of up to 2km (line-of-sight), it comes with a built-in rechargeable battery, fully adjustable controls, a USB port for connecting a mobile device and a mini-HDMI port for FPV goggles or a field monitor (camera system available separately). You can operate the Matrice 100 using the DJI Pilot app as well as view a live video feed and see telemetry data overplayed (camera available separately), access a real-time map, and more. Alternatively, thanks to the DJI SDK, you can create your own custom app - ideal for special applications. Enhanced GPS - compare to previous DJI designs - with a foldable mount helps you to track the Matrice 100's position in real time, while enabling faster satellite acquisition, more accurate position holding and flight planning. DJI's N1 flight controller provides instructions to keep the Matrice 100 stable and responsive throughout its flight. Transmitting data to the ground and bringing a live HD view (when using the separately available Zenmuse X3 camera and gimbal), the included DJI Lightbridge enables a flight range to up to 1.2 miles (depending on conditions). 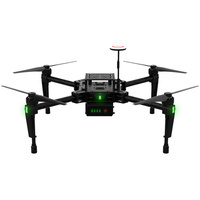 An updated version of the DJI E800 electric propulsion system powers the Matrice 100 and keeps it in flight. Four brushless motors and four Electronic Speed Controllers (ESCs) are integrated into the platform, giving you complete control during flight. With increased strength and payload capacity, the Matrice 100 aims to provide you the flexibility to create the system you need.